Turkish-Ukrainian defense cooperation "will certainly echo in Moscow, and not in a pleasant way," says one Vienna-based Russia analyst. ANKARA — Turkey and its littoral Black Sea neighbor, Ukraine, are striving to build a strategic industrial alliance that could include cooperation across a variety of military programs. A Ukrainian delegation under the umbrella of Ukroboronprom, a state-owned defense conglomerate bringing together 130 companies and engineering institutions, came to Ankara in early April to discuss future cooperation. After several meetings, the two countries agreed to sign a memorandum of understanding, the first legal text to pave the way for future joint projects. "There is a lot we can do together … work jointly. Ukraine has an established, proven industry with impressive capabilities … which can assist some of our indigenous programs," a senior Turkish procurement official said. He said that potential Turkish-Ukrainian cooperation would include programs such as missile defense, armor technologies, tank production, space, engines, satellites and fighter jets. A Turkish agent for the Ukrainian industry said the new initiative would boost comprehensive cooperation. "This can be the beginning of a long-term, mutually beneficial partnership. There is a long way ahead. If the two sides manage to handle a successful takeover a promising cruise will be ahead. The first year of talks will be crucial," he said. Ankara has its own ambitions to design, develop and manufacture indigenous fighter and tank engines as well as a program to build its own fighter jet. It also runs a number of missile programs, both tactical and cruise. "Ukraine can be a suitable partner in many Turkish programs that are just shaping up," said one defense adviser to the Turkish government. While Turkey has been careful not to strain its ties with Russia, it has been courting business with Ukraine. A London-based Turkey specialist said conditions are ripe for a possible Turkish-Ukrainian alliance to run joint programs. "There are no major bilateral political rifts that could otherwise hinder defense cooperation," he said. "In addition, there is no reason why Ukraine should not wish to share its defense technologies and capabilities with an emerging Turkish industry. That's a most alluring aspect for Ankara as it strives to make progress in several ambitious programs." The procurement official said joint programs could include the development of aircraft and tank engines, tank armor and aerospace. "We may also look at a Ukrainian aircraft body to make it a base model for our choice of the future Turkish fighter jet," he said. But some political analysts said Ankara will face a difficult balancing act in relations between Kiev and Moscow. "This [the Turkish-Ukrainian partnership] will certainly echo in Moscow, and not in a pleasant way," said one Vienna-based Russia analyst. Ukraine opposes a planned Russian-Turkish natural gas pipeline, the Turkish Stream, which replaces a long-planned South Stream project that would have carried Russian gas to Europe across the Black Sea. Russia is Turkey's largest energy supplier. "It looks increasingly difficult for Turkey to maintain its policy to balance relations with hostile neighbors Ukraine and Russia," the Russia analyst said. Turkey has been reluctant to join international sanctions against Russia after the latter's annexation of parts of the Crimean peninsula last year. Turkey has been careful not to strain its ties with Russia since then. 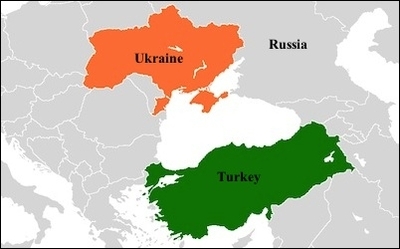 But Turkey also has been courting business with Ukraine. Earlier this year, Turkey and Ukraine held high-level strategic council meetings and agreed to boost bilateral trade and investment. Turkey has agreed to grant Ukraine US $10 million in humanitarian aid and a $450 million loan to help the war-torn country cover its budget deficit.